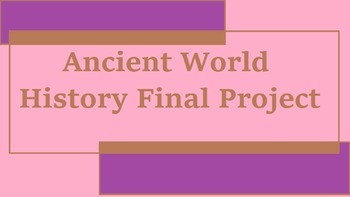 This project is meant to be given at the end of a class that discusses world history from its very beginning through the beginning of the Modern Age. Students will engage in research on a topic of their choice (chosen from a provided list) and present their findings in a method that suits their learning style. Related Products: The Beginnings of Agriculture, The Beginnings of Civilization, The First Civilizations, Catal Huyuk Webquest, Jeopardy Review Game: Beginnings of Civilization, Ancient India and China Review Game, Cultures in Contact 100-1500 Review Game, From Villages to Cities, Beginnings of Civilization Bundle, Plan Your City Simulation.